Sarah Clark (1620 – 1698) is my 10th Great Grandmother. This story is on my father’s side, so it will be of most interest to the Lindsey / Rawson side of our family. Sarah Clark was born in 1620 in England. Her father emigrated to “Virginia” in 1624 and I presume Sarah came along with him. She seems to have led a normal life until at 72 years of age we find her up to her neck in the Salem Witchcraft trials. Sarah married George Davis when she was 22 and had 10 children with him, one of whom was named Joseph. George died in 1667 when Sarah was 57 years old. 4 or 5 years later she married Nicholas Rist. They appear to have had one son, also named Joseph, born in 1680, when she would have been 60 years old. . . Having a child at 60 years old also named Joseph all seems a bit unlikely . . . So while it’s not completely clear, she seems to have had at least 10 children and two marriages. And then, if 10 children wasn’t enough, in 1692, at the age of 72, she got into real trouble. She was charged with witchcraft and arrested on May 26 and spent 5 months in jail waiting for trial. 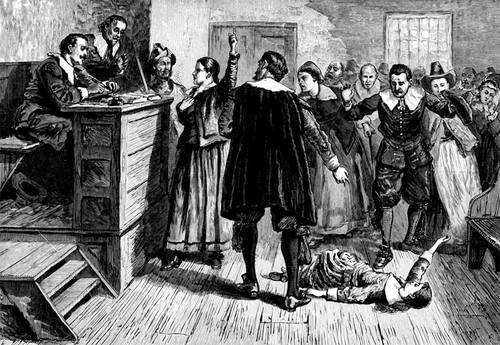 The Salem witchcraft trials concluded with the final hanging of accused witches on September 22, 1692. She was, thankfully, not either tried or hanged and her husband Nicholas bailed her out of jail in late October. She died about 5 years later and left a will. We have some small details of that will. Sarah married Nicholas Rist after the death of her husband, George Davis. On May 26, 1692, Sarah was accused of witchcraft by Mary Marshall, Mary Wolcott, and Ann Putnam. Mary Marshall was her step-niece. On May 28th, an arrest warrant was issued for Sarah, and she was arrested on May 31, 1692. To the Constables in Reding. You are in theire Majesties names hereby required to apprehend and bring before us, Sarah Rist the wife of Nicholas Rist of Reding on Tuesday next being the 31st day of this Instant moneth at the house of Lt. Nathan’l Ingersalls at Salem Village aboute ten of the Clock in the forenoon, who stand charged with having Committed sundry acts of witchcraft on ye Bodys of Mary Walcott and Abigail Williams & others to theire great hurte &c, in order to her Examination Relateing to ye premises abovesaid faile not. Dated Salem May 28th 1692. P vs. J. Hathorne } Assists. Attest John Parker Constable fo Redding. Abig ail Williams, age 11, along with the slave Tituba, lived at Salem Village (now Danvers) in the household of her uncle, Rev. Samuel Parris. The accuser, Mary Walcott, was 16 years old. Lt. Nathaniel Ingersoll was a deacon in the church at Salem Village and keeper of the town’s ordinary. John Hathorne, ancestor of Nathaniel Hawthorne, and Jonathan Corwin were members of the General Court and magistrates at Salem Town who conducted hearings in the witchcraft cases [Devil]. To Mr. John Arnold, Keeper of the Prison in Boston, in the County of Suffolk. Whereas Captain John Aldin (Alden) of Boston, Marriner, and Sarah Rice, Wife of Nicholas Rist of Reding, Husbandman, have been this day brought before us, Joh Hathorn and Jonathan Curwin, Esquires; being accused and suspected of perpetrating divers acts of Witchcraft, contrary to the form of the Statute, in that Case made and provided: These are therefore in Their Majesties, King William and Quen Marys Names, to Will and require you, to take into your Custody, the bodies of the said John Alden, and Sarah Rist, and them safely keep, until they shall thence be delivered by due course of Law; Given under our hands at Salem Village, the 31st of May, in the Fourth Year of the Reign of our Sovereign Lord and Lady, William and Mary, now King and Quen over England, etc., Anno Dom. 1692. Captain John Alden, Jr., was the son of John Alden of the Mayflower. He escaped after having been imprisoned for fifteen weeks, and then was returned and cleared by proclamation in the Superior Court of Boston on the last Tuesday in April 1693. The humble petition of of Nicholas Rist of Reading she weth, that whereas Sarah Rist, wife of the petitioner, was taken into custody, the first day of June last, and hath since lain in Boston Jail for witchcraft, though in all that time nothing has been made to appear, for which she deserved imprisonment or death. The petitioner has been a husband to the said woman above twenty years, in all which time, he had never reason to accuse her of any impietie or witchcraft; but the contrary, she lived with him as a good, faithful, dutiful wife, and always had respect to the ordinances of God, while her strength remained; and the petitioner on that consideration, is obliged in conscience and justice to use all lawful means for the support and preservation of her life; and it is deplorable, that in old age, the poor decrepid woman should lye under confinement in a stinking jail, when her circumstances rather require a Nurse to attend her. May it therefore please your Honors to take this matter into your present consideration, and direct some speedy method, whereby this ancient and decrepid person may not forever lye in such misery, wherein her life is made more afflictive to her than death. And the petitioner shall, as in duty bound, ever pray. Is hezekiah hore kin to sarah clark? If so, how? I don’t have any information that would lead me to believe they are related. Why do you ask. Hezekiah Hoar married Rebecca, who’s maiden name I don’t know. They married in 1653. Sarah Clark was born in 1620. So clearly Sarah’s not descended from Hezekiah. It’s of course possible that they share common ancestors. Hi: I’m not sure what your question is. You’re commenting on a story about Sarah Clark and asking about Hezekiah. Why? what where Sarah’s kids names? we researched and on my dads side, we are in relation to sarah clark. Sarah is my 11th Great Grandmother on my mother’s side of the family, this is very interesting information.